Cable TV's Showtime Coast To Coast; a unique series of in-concert performances, interviews and collaborations hosted by Herbie Hancock. Joni is a guest on the debut show for a jam session with Herbie, Bobby McFerrin, Wayne Shorter, David Sanborn and Larry Klein. A great reinterpretation, like a brazilian samba. Is that Omar Hakim on drums? Hejira is an absolutely stunning song - an original in songwriting as is all of Joni's - based just on two chords a semi tone apart. Joni reinvented songwriting by disregarding the usual form of songs - she doesn't have a verse or chorus - but you don't notice that. All her songs tell a narrative, a free form story with lyrics that when you read them are breath taking word picture poetry. 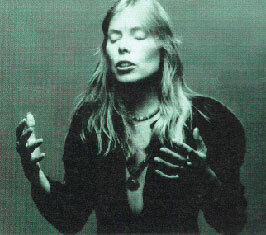 Joni is the greatest overrall popular music talent that has ever been - songwriter, singer, painter, musician, poet. She even invented her own way of playing guitar with her own completely individual tuning of the guitar.